Like-New Holiday Remainder Book Sale! 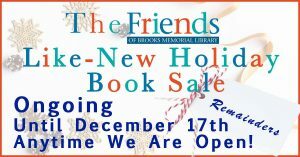 The Like-New Holiday Remainder Book Sale will continue until December 16th! Don’t forget to pick up raffle tickets for one of the fabulous gift baskets that have been so kindly donated! Raffle tickets are $2 each, but you can increase your chances by buying 3 for $5. The Raffle Drawing will be held no later than 6 pm on December 17th, so you have plenty of time to purchase your tickets at the circulation desk! Please make sure to print your name and phone number very clearly, so that we will be able to contact you. The Friends of Brooks Memorial Library raise funds for library programming, including the First Wednesday series, as well as technology purchases and resources such as the Foundation Center and Lynda.com.